Book Reviews – Dark Summit | C.H.A.M.P. It is not quite as simple as all of that of course. The mountaineering companies have an obligation to their own clients first, and high altitude rescues are almost impossible in most cases, and attempting to rescue another could mean your own death. Reading this, I was struck by how hard it must be to turn around so close to the summit. The team leader has to try to guide a person to make sure they get back, but they’ve spent thousands even tens of thousands for the summit and so may push too hard and not be able to get back, in fact about 80% of fatalities occur on the way down. Some people have dramatic death fall plunges, but others simply sit down and give up or just shut down, unable to move any further. The brain deprived of oxygen is a scary thing. When trying to talk to the survivors about what happened up on the mountain, you can never know if 100% of it is true or just what that person experienced. 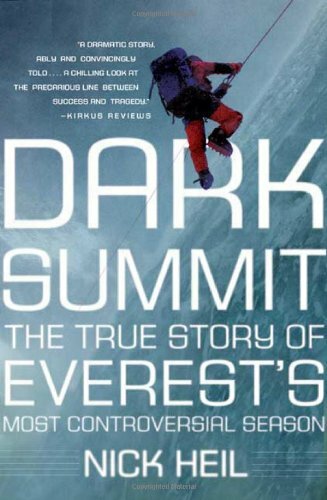 In any case, Dark Summit was an interesting read. I would recommend it to any others who have enthusiasm for mountaineering books and tales of survival.